In the last few months a good part of my research has been about Mueller matrix microscopy. 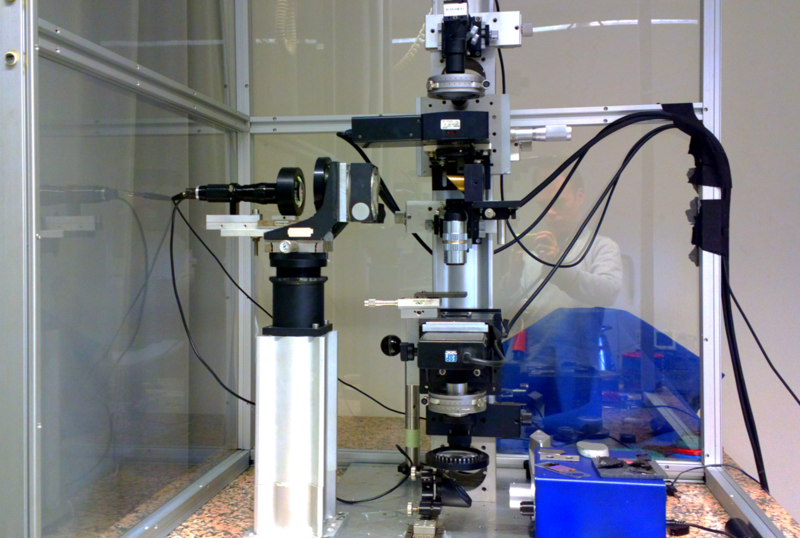 We have developed a new MM microscope that uses a dual rotating compensator setup and digital demodulation. The spatial resolution and measurement quality is really good. See related publications here and here. This week we have published a paper titled Complete polarimetry on the asymmetric transmission through subwavelength hole arrays. I think it is a quite interesting topic because it mixes polarimetry, which by default is quite cool, with a surprising effect such as extraordinary optical transmission. Also the paper offers some clarification on concepts about 2d chirality, asymmetric transmission. During the past week I was in Ecole Polytechnique, working with Razvigor Ossikovski and Enric Garcia Caurel for a scientific collaboration. Hopefully the results will be seen soon. At the beginning of May I attended SPIE.DSS conference 2014 in Baltimore (Maryland, USA). I had never been in a conference that huge. Also I took advantage that Baltimore is close to NYC to visit again my old laboratory. I was happy to see that my old 4PEM MM polarimeter is doing fine. This entry was posted in Uncategorized on June 1, 2014 by loiro.